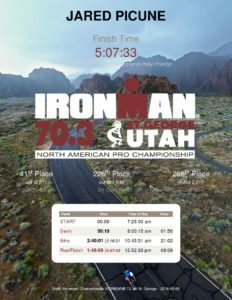 My first race of 2018 is is the books, IRONMAN 70.3 St. George. 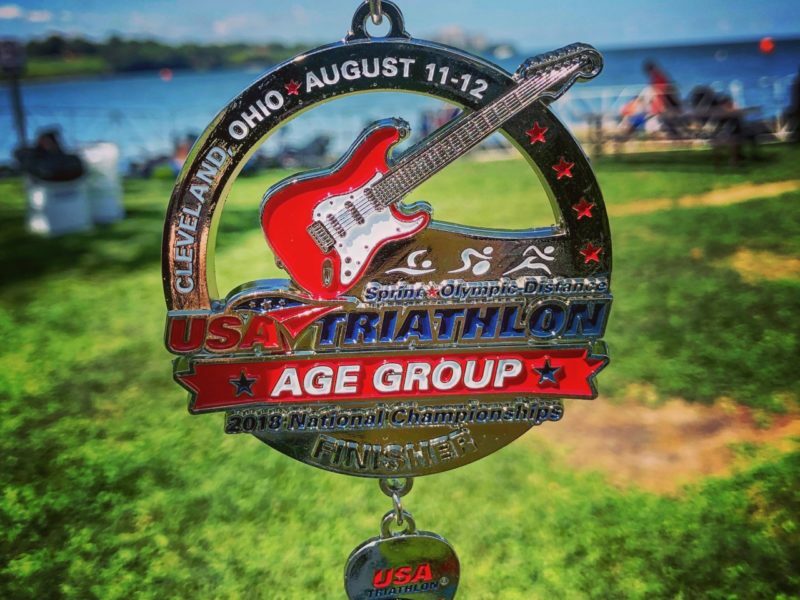 It’s hard to believe that this is only my fourth half Ironman distance event and my second IRONMAN branded 70.3. A couple years back when I started it’s hard to believe that I would come to enjoy this distance. 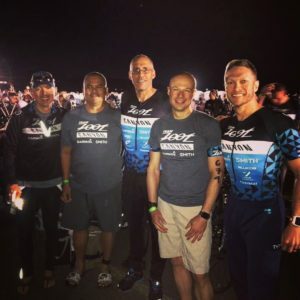 Here is my race recap from one challenging half Ironman triathlon! 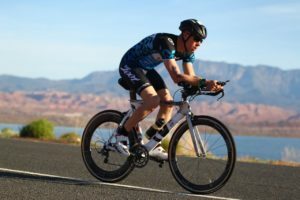 The idea of racing St. George came last year after racing the Rage Triathlon in Las Vegas last year. Since it’s quite a drive to get to and from Las Vegas, we had stayed in St. George on the way home to help break up the drive. 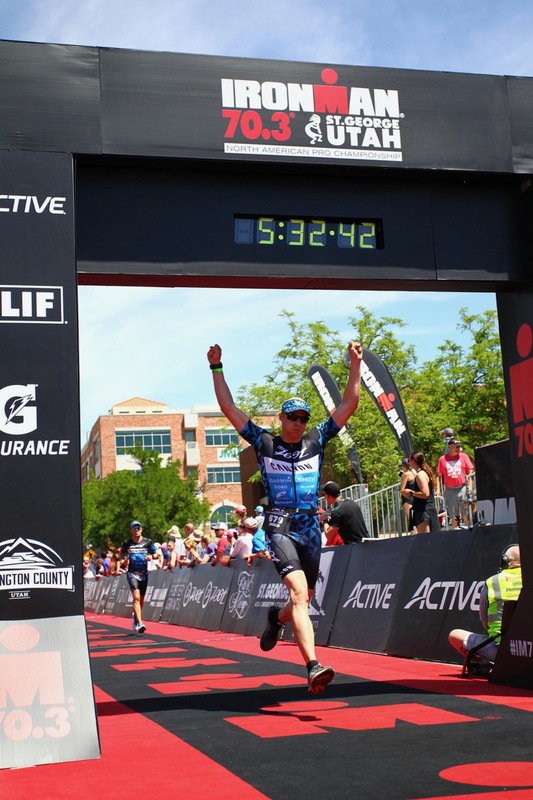 I’ve probably head thing about St. George as long as I’ve been hearing about IRONMAN racing. In fact I never even though about the town until I heard about this race. So as we drove though I was curious about what the race would be like. 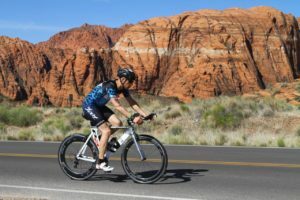 The one night we stayed there was enough to get my juices flowing and when it came time to pick my 2018 races St. George was my pick to replace the Rage Triathlon that I had done the previous two years. 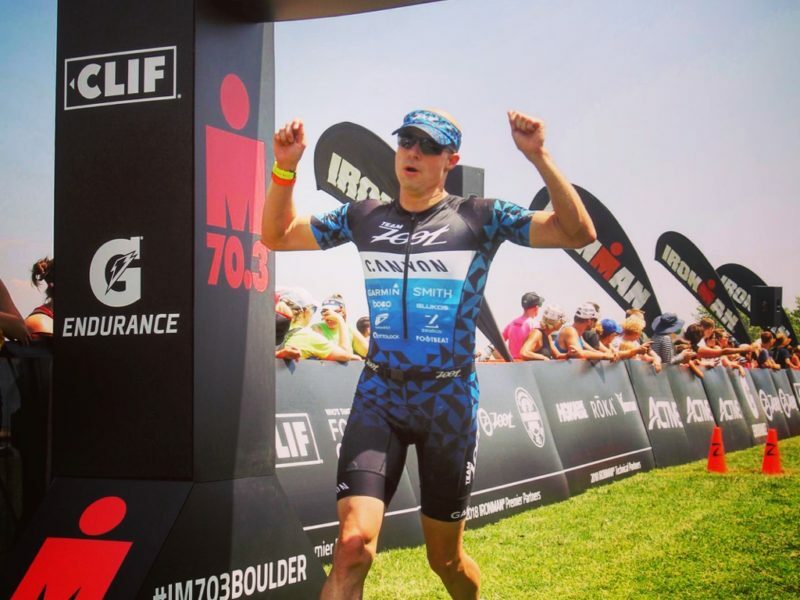 This would mean that it would be a bit of a challenge, starting the season with a half Ironman, but after all I was looking for a good challenge. The logistics of St. George were very similar to Las Vegas, although two hours less of a drive, which was very welcome. We broke up the drive and stayed in Grand Junction the night before we finished the drive to St. George. It’s nearly a ten hour drive door to door so shaving a couple hours off makes a world of difference. 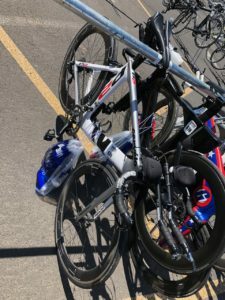 The only catch was I had to register and get my bike dropped off at transition the day before the race. So we had to leave Grand Junction pretty early to get to St. George in time. We arrived with plenty of time though. When we got to St. George we went right to registration. I had an idea of where it was, but didn’t have any clue where to park. We got really lucky and actually found a spot right next to the venue. We walked over and I went strait to the AWA line and got the process started. It was pretty basic and I was done in about 5 minutes. 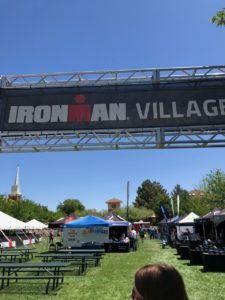 St. George has two transition area for the race. It’s a bit of a challenge logistically, but very nice on race day. I had to leave my run backs in transition two, which was next to registration and the finish line. But the bike has to go to Sand Hallow, so we had to drive out there next. Before we left, as I was packing the car I noticed that there was a white spot on my back tire. I had been riding my tri bike a lot and was concerned that the tire was worn. As we were looking around IRONMAN Village at registration I noticed a bike mechanic. I went to the are and grabbed my bike for them to take a look at the tire. Sure enough the tire was shot and I had to get a new set. Crisis averted! It cost pretty penny though. It was about a 30 minute drive to Sand Hallow, not bad but it was crowded as everyone was dropping off their bikes. We finally got parked and I prepped my bike. I was able to take it for a quick spin about the parking lot to make sure everything was working correctly. 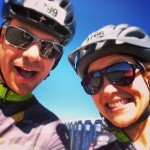 I then loaded my bike up on the rack and we headed back to St. George to check into the hotel. We were staying at the Comfort Suites which was right off the highway. I would later find out that the run course would go right behind the hotel. After we got checked in Lauren and I weren’t sure what to do. We decided to go shopping and then grab dinner. We needed up at a all you can eat pizza place. Depending on how you look at your fueling strategy, this could be a good or a bad thing. 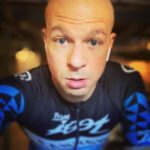 As a fat adapted athlete, it was not a good thing. 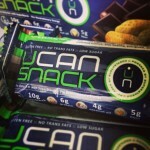 Although I’m finding that a short carb load the night before a race is working well for my performance. After dinner when headed back to the hotel and I got a good night rest. Race morning I had to wake up a little after 3am. It was early but I wanted to make sure I had enough time in the morning. The fist shuttle busses from St. George to Sand Hallow started running at 4:30. I walked from the hotel to the Town Square, which was a little bit longer than I expected. About a 20 minute walk. Not a bad way to get warmed up a little though. 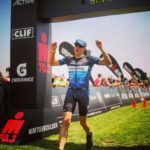 I got to transition and played out my shoes, nutrition, race belt and visor for the run. I then hopped on a but to Sand Hallow. I was really early when I got there, still before 5 am. I didn’t have much to do to set up the bike transition area, so there was a lot of time waiting around. Or in the bathroom line. We quickly realized that the bike rack was a Team Zoot bike rack. I remember hearing that we would get our our rack before the race. It was a great way to meet other people on the team. We chatted for a bit, snapped a few pictures and got ready to race. The swim was a rolling start. I really like rolling starts because you can seat yourself based on your ability level which mean you are not getting swam over the whole time. Important for slower swimmers like me. I got into the 35-37 minute section and patiently waited to get started. The rolling started seemed to take a while to get going. I was staring to get nervous, mostly about the water temperature. It was supposed to be just under 64° which is quite cold in my opinion. Eventually I made my way down to the waters edge. There was a red sand that was quite beautiful and the water had a light blue tint that made it look quite inviting. There were letting 3 people in a a time, and when the buzzer sounded for my spot I jumped right it. The cold water covered my body and took my breath away. Damn it was cold. But quickly by body warmed up and I began to swim. 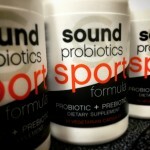 I’ve been working hard on my swim, and was hoping to have good results this race. Unfortunately, I hadn’t had an open water wetsuit swim in a long time and that took a bit of an adjustment. Also I had to factor in sighting which I haven’t been doing. Although IRONMAN does a great job with the buoys which helps tremendously. Once I adjusted the water was really nice, clear and cool and I felt like I had a great swim. I did have one side of my goggles leaking which was an annoyance but I got though. The swim went by pretty fast and I had reached the end of the course before I knew it. I cam out of the water and started stopping off my suit. It got stuck on my watch and had to pause for a second to figure out how to get it off. I then went other wetsuit strippers and the pealed off my suit, easy! I ran to transition not rushing, but taking my time, I was worried about getting my socks on. It did take some time, but it got done and I was on my way out to the bike course. The was a steady stream of cyclists hitting the course along with me. 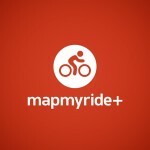 I always try to gauge where I am place wise when I start the bike, but it was hard to tell. Some bikes were gone, many where still there. With the rolling start it really doesn’t matter. As I started off on the bike we had an easy downhill and I got up to speed fast. Then came a small climb. I motored past many and though to myself this isn’t much of a hill, I’ve got this. I would come to find out that was just a baby. The course turned out to be quite a challenge, much more so than I anticipated. The road conditions were wonderful, some roads were chip and seal that rode a bit rough. However, I was impressed with how well they were maintained. About halfway though the course I saw a large Red Bull arch. I looked over and saw an aid station for the run. Then I saw Lionel Sanders leading the race with Sebastian Kienle right behind. I smile, how cool it was to see these superstars of the sport racing. As the course progressed I would grind up the climbs and cruse down hill hitting speeds in the 40’s quite often. I held strong on the course passing many people along the way. I did get passed every now and then, but you can count them all on one hand. I was feeling good about the bike. Time started creeping up and as I approached the two hour mark I knew I still have more than 10 miles left to go. 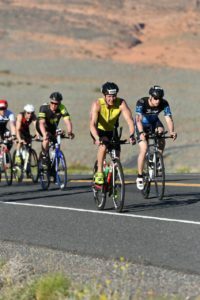 I was worried about what my time would be, especially as the last portion of the course was the big climb though Snow Canyon. Just before the climb there was a flat out and back section of the course. I liked this because you could see who was in front of you and it was also a quick section where I could make up some good time. I pushed though passing many people on this section. And then it was time for Snow Canyon. Entering the park, it didn’t seem so steep. I was cursing at 19MPH or so for a while. But what didn’t look to be a climb quickly turned into a grind. It was beautiful though and the slow speeds make it easier to take in the sights. The climb was long, but I powered though and made it to the top! It was all down hill to the finish, and man I flew. I was speeding along and surprised to have a few people pass me, but it was okay, time to recover a little and get ready for the run. We speed back towards St. George and to the second transition area. As I racked my bike I saw that my gear was spread all over the place. Someone must have hit it. I got my shoes on, but couldn’t find my vizor. I though were all had the same vizors on that rack did someone take it? But then I saw it just on the other side of my bike tire, so I grabbed it and started the run. I told myself to start of slow and work up to a good page. So I did just that. As I was leaving transition there was a sunscreen station. I stopped, better to be safe and take the 30 seconds. Unfortunately the lady that put it on hit my watch and stopped it. I didn’t notice until I was about a tenth of a mile onto the course. The first 4 miles of the run course were up hill. I knew this and I wasn’t looking forward to it. 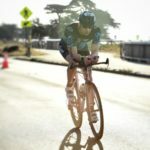 What I hadn’t realized until the end of the bike, was that the run corse stared on the same road as the end of the bike course. It was a gentle slope in for the bike and fortunately a very gentle grade for the run. Much less than I was expecting. As I started the run I heard the announcement that Lionel Sanders had won and the rest of the male pros were headed back to the finish. Since it’s basically a out and back course it was fun to see all of these fast guys finish. And not far behind were the female pros. Jeanni Seymour was just behind Paula Findlay and I though she would overtake her. It didn’t happen though. After the first two miles I thought that I had this, I had a good pace, and the climb wasn’t killing me. Then came the real hill! It got steep and just seemed to keep going. We shared this section of the course with the bike, which I remembered all to well. I just kept pushing forward. Finally we got to go downhill. It was a welcome relief, but it was steep and not easy. The rest of the course continued in this fashion, up and then down. 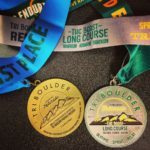 I looked forward to each aid station, knowing that when I reached one another mile was in the books. I didn’t stop but grabbed a cup of water, drank what I could then poured the rest over my head. The temperature was rising, but it wasn’t too bad. Felt much better than the temperatures I experienced in Aruba. I was doing good on time, but wasn’t sure exactly where I was at overall. My watch was slightly off because of the pause at the beginning of the run and I never looked at my final swim time. I really wanted to finish under 5 hours and I though I was on track to do so. Finally I reach mile 10, I was at the home stretch. I had one more steep climb and then it was downhill the rest of the way. I powered though that last climb, it was really something. The I cruised down towards the finish. The downhill momentum was great, but I was pushing it as fast as I could go. I got passed by a few people and passed many more. I was in the home stretch and I knew I was close to getting my time. As I came up on the final stretch a guy came up and ran next to me. He was on Team Zoot too! We briefly chatted and we ran though the screaming crowd. I saw Lauren and waved and then there was the finish chute lined with the red carpet and M dot logos. I just went for it and started sprinting! 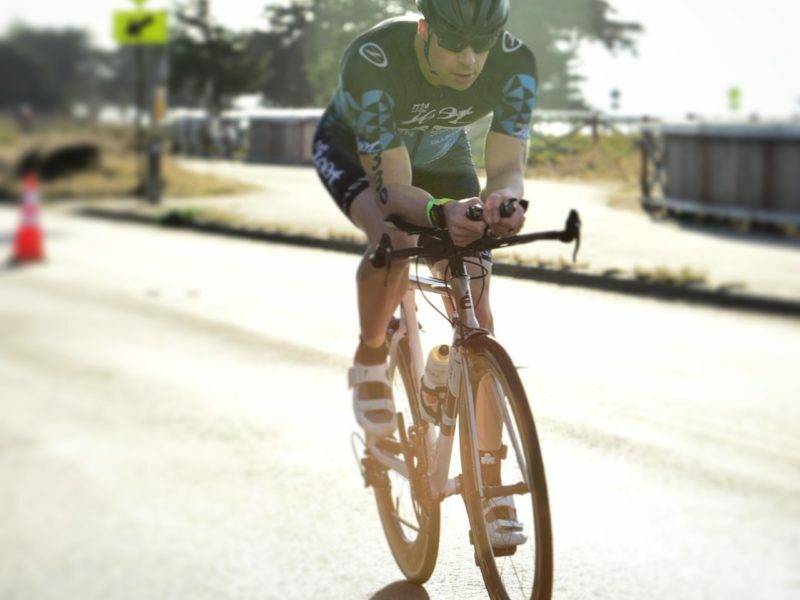 The clock read 5:30 and I figured I started 45 minutes later so I would have set a new 70.3 PR. Well that was not the case. I ended up finishing in 5:07:33. A very good time given the challenging course. I was a little disappointed to say the least. I ended up in 41st place in my devotion, which sounds rather low, however I was still in the top 12%. 10% of the entire field was in my division and it’s quite competitive. The race was much more of a challenge than I though so I’m very happy with the results. While my bike was considerably slower, the elevation gain accounts for that. 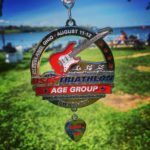 I had my fastest half marathon every and a 35 minute swim which is a great time and PR for me! 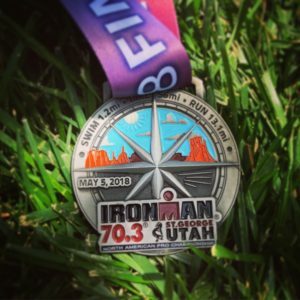 IRONMAN 70.3 St. George was one hell of a good race. Not only was it beautiful, but all run in a fun little town. I’m so happy with my results starting the season off strong and looking to be more competitive going forward. Up next is IROMAN Boulder, where we’ll see how I can can hold up at the full IRONMAN distance.